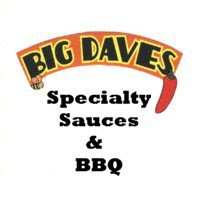 Today's BBQ sauce market is so large and diverse, it can be difficult to stand out in the crowd. Fortunately for Nephew's BBQ Sauce, standing out has never been a problem. Nephew's entire line of gourmet sauces feature unique blends of sweet fruits with spicy chili peppers. Signature flavors like Ghostly Pumpkin, Peachy Potle and Haban' Orange have quickly made Nephew's BBQ sauce a North Carolina favorite. I had the pleasure of meeting Paul Abrams, owner and creator of Nephew's BBQ Sauce, at the Capital Cook Off in Lexington, NC. Paul was equally gracious and enthusiastic. Despite being busy putting the finishing touches on his competition ribs and chicken, Paul still took time to talk with Katie and I about his sauces. Better still, he also provided products for review. After getting a solid endorsement from fellow BBQ blogger, Wayne Brown, I was excited to give Nephew's BBQ Sauces a try. As cool as all the Nephew's flavors looked, Ghostly Pumpkin piqued my interest the most. It looked so good that I cracked the seal on 16 oz mason jar the very next day. The rich aroma was like a tangy, smokey pumpkin pie. The burnt orange sauce is thick and blends real pumpkin with ketchup, spices and jolokia (ghost) peppers. Though the pumpkin dominates the aroma, it moves into a supporting role in the flavor. The initial flavor is familiar with both sweet and smokey elements. Nephew's Ghostly Pumpkin finishes with smooth pumpkin and touch of heat. The spice level is pretty tame considering the inclusion of ghost peppers. The pumpkin actually seems to mellow the heat and marries surprisingly well with the chili peppers. There was just enough spice to remind me that the peppers were present, but not enough to scare anyone away. I used Nephew's Ghostly Pumpkin on a few different occasions. I first used it to finish chicken quarters. The thick sauce clung nicely to the chicken's skin. It also gave it great color. Chicken turned out to be my favorite meat to pair with Ghostly Pumpkin. Whether used as a dip or a grilling glaze, it gave all kinds of flavor to the poultry. It also has me thinking that it will be a great sauce to pair with a smoked turkey during the holidays. After having great success with chicken, I used the remainder of the jar on a rack of St. Louis style ribs. Once again, the flavors from the sauce were very good with the smoked pork. It was reminiscent of a sweet and smokey holiday ham. The only problem I had with Ghostly Pumpkin on the ribs was the presentation. The inclusion of so much real pumpkin prevents the sauce from having that high gloss finish that makes sauced ribs look so appealing. Ghostly Pumpkin is a bold and creative sauce with big flavor and lots of character. Trying to market such a unique flavor takes courage and creativity. However, after meeting Paul, I would expect nothing less. Nephew's pitches Ghostly Pumpkin as a seasonal sauce, but it's just too good to only use in the fall. To learn more about Nephew's BBQ Sauce, check out their website. They're also on Facebook. Drop Paul a line and tell him The "Q" Review sent you. Don't forget to see how Ghostly Pumpkin rates on our "Product Reviews" page. 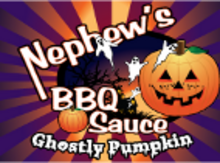 2 Response to "Nephew's Ghostly Pumpkin BBQ Sauce"
The Ghostly Pumpkin sauce is one of the more unique sauces on the market. People are either going to love it or hate it. For what it does, I think it does quite well.